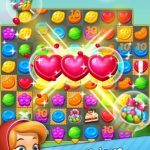 Bits of Sweets is that rare Match 3 game that’s only available on one mobile platform (iOS), though Puzzle Dreams Limited has promised to roll out an Android version soon. The premise of the game is a simple one: you’re there to mix bonbons and crumble cookies, while solving “deliciously challenging” puzzles across various locations and helping the appropriately named Cara and Mel “escape from an ugly, gluttonous witch.” Like you would in other Match 3 games, matching more than three pieces will allow you to create special pieces, and you’ll also have a chance to collect stuff in the levels, teaware in particular. You will also have to get those “bad” candies and “angry” pastries out of the board, which adds to the challenge of the game. Now, it may seem as if Match 3 games are all best played in a certain way, as the general mechanics don’t often vary from each other. But this genre of mobile gaming is so popular that it still attracts new players every day, and every high-profile Match 3 game, as we’ve noticed, has a difference or two from other titles. So join us now as we present our list of Bits of Sweets tips and tricks. Bits of Sweets will give you one chance per day to spin the caramel wheel for free, with each spin costing you more coins; the second spin costs 10 coins, the third 15 coins, the fourth 20 coins, and so on and so forth. Spinning the wheel allows you to win 10, 20, or 50 coins, so if you’re feeling lucky, you can probably give the wheel a try about twice or thrice a day. Or maybe even four times, if you’re lucky enough to get 50 coins beforehand. Play the wheel right and you might even earn some profit out of it. As a disclaimer of sorts, coins are just one of the things you can win by spinning the wheel. You can also get power-ups for free, though as any Match 3 player knows, those power-ups are always good to have around, especially if you get them for free. The game also comes with a bonus level, which is essentially a mini-game where you can place bets to earn more coins. The more coins you place as your bet, the larger the potential jackpot will be. 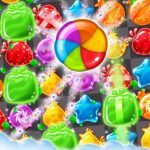 The rainbow candies will be your best bet – more on them later – when it comes to beating this mini-game, and they will be very important, as the bonus level happens to be more difficult than the regular ones, even if it’s just an optional one that doesn’t affect your progression in any way! Unfortunately, Bits of Sweets is one of those games where the ads can be a nuisance. Yes, we feel your pain here; games where the ads can throw you off and ruin your focus are indeed annoying to play, even if ads are how developers earn their money. But the good thing about this game is that you can turn off the ads simply by paying three coins. That’s not a lot of coins to spend, so feel free to plunk down those coins if you want to enjoy an ad-free gaming experience. For each level you fail to complete, you will lose one life, and once you’re all out of lives, you will have to wait a few hours before those lives get restored. That’s the most hassle-free way to regain your lives, though we do know that it can be quite tedious to wait that long. So with that in mind, you can connect your game to Facebook and ask your friends for lives, or pay coins in order to regain them ASAP. If you don’t have friends who play Bits of Sweets, you can always add more friends through the comments sections of game reviews (or App Store reviews themselves), or create a dummy gaming account and do the same. 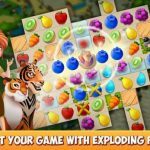 This game is similar to so many other Match 3 games – in fact, maybe all Match 3 games – as you can create special pieces by matching more than three. And here are some of the more effective special pieces you can create. If you match five in an L-shape, you’ll get an X candy, and if you match five in a T-shape, you’ll get a bomb candy. Matching five in a row gets you a rainbow candy. 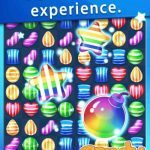 By mixing any candy with a rainbow candy, you’ll get rid of all the pieces of that color, allowing you to achieve the level’s goals faster and finish a level in far less moves. And if you want to destroy the entire board and finish the level instantly, include two rainbows in the same match.